Here is a chance for fresh nursing graduates to be Health Insurance Support Agent in AbuDhabi. The requirements include minimum one year Experience and Job Location is Abu Dhabi, UAE. Apply directly for the post of Health Insurance Support Agent in one of the most renowned "Daman". We saw that job profile includes, serve as liaison between the medical providers and medical departments(Authorization, Claims and Underwriting Services).Basic knowledge of insurance sector is also essential. 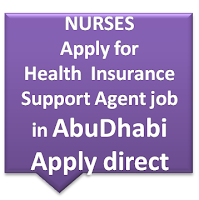 More details here to know more details about this post of Health Insurance Support Agent job for Nurses in Abudhabi. 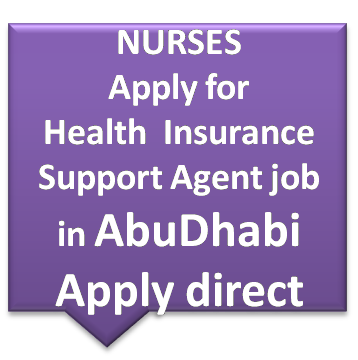 How to apply for the post of Health Insurance Support Agent job for Nursing Graduates in AbuDhabi. Dear nurses, please find the link in the above paragraph , "More details here" to reach the full details and application channel. Kindly provide all details and most importantly, read the requirements carefully.